What Is A Depreciation Schedule And Why Should You Get One Done? 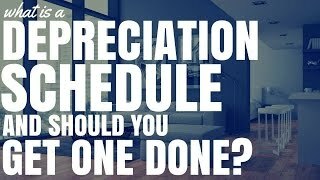 What Is A Depreciation Schedule And Why Should You Get One Done? A depreciation schedule is something every single investor should invest in. It helps you to legally minimise the tax you have to pay as well as maximise the return on investment for your property. Depreciation or claiming the lowering in value of add-ons within your property or the property itself can be a great way to minimize your tax expenses and to maximize your return on investment. I was lucky enough to be able to sit down with Brad from BMT Quantity Surveyors. Brad is the Managing Director of BMT and they are the largest Quantity Surveyor Company in all of Australia. We sat down and we talked about the benefits of depreciation and I have broken this into a ten part series to help you easily understand depreciation and how you can use it to minimize your tax and maximize your return. If you want to see the links to all of the episodes, head over to www.onproperty.com.au/depreciation and you can get all the links there, or if you want to go to specifically this property, that’s www.onproperty.com.au/140. So, today I talk to Brad about, what exactly depreciation is and what the depreciation schedule is and when can we get one done. I will be back at the end of the interview to summarize. Hi guys, this is Ryan from On Property, your daily dose of property education and inspiration. Today I am very grateful to have with me Brad from BMT Tax Depreciation. And today we do depreciation schedules and help investors maximize their return on investment through depreciation. Ryan: Thank you for coming today. Ryan: Let’s start super basic and let’s look at: What is a depreciation schedule and why should an investor get one done. Brad: All our investment properties have a depreciation value, effectively, the things in there are getting old and wearing out, and the tax office said they have allowed us to claim a part of the cost for those things each year as a deduction. So, one day the carpet is going to wear out and things like and so we put a cost on those things, the tax office accepts and work out how much deduction we are able to claim for. Ryan: So, in terms of, I guess, in doing our calculations and things like that it’s not money that as an investor we are paying out each and every month or every year, it’s actually I guess what they call defensive cash flow in a way, in that you are claiming the lowering in value of an add-on, even though you still have that add-on its not actually affecting your financially yet. Brad: Yes, it’s like the opposite to what they call a non-cash tax deduction, you might have other deductions in relation to your property, the interest and other things and losses, but you pay those things up, depreciation is just that as things are getting older and wearing out so we get to make the deduction actually before that without actually having to pay that money yet, so it might seems much more lucrative, same like defensive cash flow I suppose, because not paid up, we get a deduction for it. Ryan: So, would it be safe to say that depreciation on a property is similar to the way business depreciates in that they are using the car for income generating purposes it’s going down in value each year, as we all know cars do, and they are claiming that depreciating value each year. Is that similar to property? Brad: Very similar, anything you use in your business often you get to depreciate, like your car for example, because your car is actually depreciating in value as well. The difference is, and people often go, “But isn’t my property appreciating, that’s why I’m buying property.” Well, the fact is the property itself hopefully, if you buy the right land is appreciating, but the building itself is actually going to wear out, things are going to wear out, so that is depreciating. Even though we are appreciating the value of the property, we are actually depreciating the building and the contents. Ryan: So people need to be able to separate the value of their property as a whole in terms of what it is worth if they are going to resell it, what the banks revalue it at as to the physical building that is on the piece of land and that within a brick structure is actually going down in value over time as wear and tear. Ryan: The old water heater is going to need replacing …..
Brad: Yes, most definitely and the dishwasher right back down to the tub, so the fact is you get to claim the depreciation related to that aspect. Okay, so just to summarize, depreciation is the lowering of value of items within your property or the construction of the property itself. A depreciation schedule is a report that is done by a quantity surveyor like BMT, which gives you the breakdown of your property and all the items within your property and how much you can depreciate and how fast they depreciate. There is a lot of detail that goes into these depreciation schedules and it’s not something that you should and really can do yourself so I do suggest you going out there and getting a report done so that you can maximize your return on investment and maximize your tax savings. In the future episode, Brad was saying that the average depreciation is anywhere between $5,000 and $10,000. Now, obviously newer properties have more depreciation than older properties may have less, but $5,000 to $10,000 in paper losses that you can claim each and every year can mean massive savings for you, so it is definitely something that is worth looking into. You can check out BMT by going to www.bmtqs.com.au or you can just Google quantity surveyor in your local area to find a local quantity surveyor. For the full transcription of the downloadable PDF, head over to onproperty.com.au/140. And today’s episode is brought to you by my own product which is the Advanced Property Calculator. When you are going out and you are investing and you are trying to find a property, it’s really important that you understand how the cash flow of that property is going to impact you. Is it going to be negatively gained, is it going to be positive cash flow and by how much each week and each year. The Advanced Property Calculator means that you don’t have to do that by hand, it’s on a cell spread sheet where you just punch in the figures and it shoots out an estimate of exactly what cash flow that property is estimated to generate. You can get that by going to www.onproperty.com.au/apc and there is also a free bonus that comes with that as well.